Much of The Oast’s fantastic history remains a mystery. A fire, late last century, destroyed almost all of the records kept by the centre. If you have any information that may be of interest to our history and conservation team, please get in touch: history@oastcentre.org. The Wakeley Brothers were a local, entrepreneurial family. Established in 1897, they farmed in the local area around Rainham and Upchurch. Their main crops were hops and top fruits, cherries, plums, apples and pears. Hop drying techniques changed in the mid 20th century. 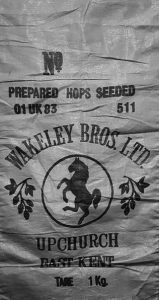 The Wakeley Brothers business, consequently made the decision to replace their five old existing Oast Houses in Upchurch and Rainham and build a brand new purpose built facility in Spade Lane. It was ‘out with old’ and ‘in with the new’ and The ‘Station’ Oast was up For Sale in the late 1960s. 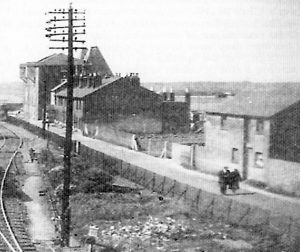 Rainham station and Oast c. 1950s, original from Sunburst Bookshop, Station Rd. Several local Professional Business people travelled to London, by train, from Rainham daily as commuters. Between them, it seems they realised the potential of the huge old building, as a new venue for the Rainham and Wigmore Community Association (RWCA). They discussed options and used their personal talents and skills to work together to enable the RWCA to purchase and transform this massive Oast building into a wonderful useable community space. Platform Row Cottages, alongside the Oast were also part of the the Sale. They were sold off and demolished. The sale of the cottages and many other activities organised by the local Rainham Community produced funds for the monumental conversion and building works to develop a new home for the Rainham and Wigmore Community. Today, thanks to the hard work and dedication of many friends, volunteers and local businesses over the past fifty years; the Rainham and Wigmore Community Association continues to maintain this wonderful facility for everyone to use and enjoy into the forseeable future.